Foursquare has over a million registered users globally now. Of these users, what sort of demographic has the highest usage? if you are a business using Foursquare to target customers and see their feedback – what sort of people are you reaching out to? In order the judge the popularity of Foursquare amongst users in Sydney, Australia i ran a ‘tests’ at several locations in Sydney. Mecca Espresso is a trendy cafe in King st, Sydney CBD. Attracting mainly white collar business professionals i was surprised to see 9 people had checked-in over a 2 hour period. Say 100 people went into the coffee store over the last 2 hours, this would be 9% of users checking into Foursquare. 2. Sydney Cricket Ground/ Sydney Football Stadium – Sunday Afternoon watching a NRL game. 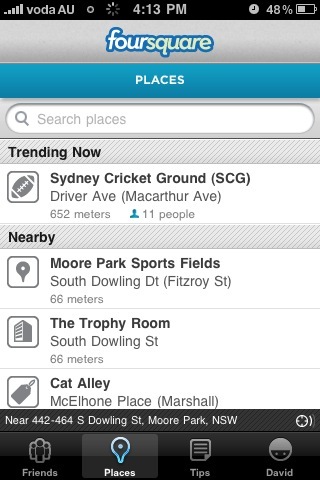 Obviously attracting a different user demographic to the Mecca Espresso CBD business crowd, the number of people who checked-in to Foursquare was very small, out of 30,000+ people watching the football game. This equated to about 0.04% of people who attended the game checked-in to Foursquare. 3. Social Media Club Sydney #SMCSYD – 8pm Oxford Art Factory, Oxford st, Darlinghurst. There were probably 200 attendees at the Sydney Social Media club last night – mainly a group of media and technology professionals interested in hearing about up and coming social media tips and strategies. I would say almost 20% of the crowd checked-in to Foursquare over the night. 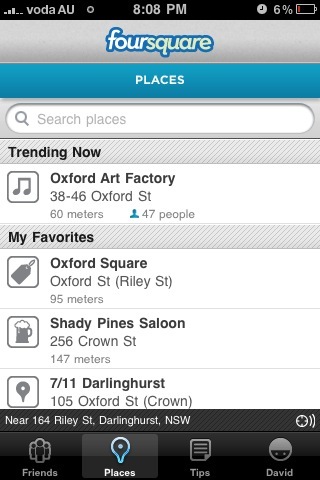 Its clear Foursquare is getting high usage from Media professionals, business workers – whilst it has not penetrated the general population yet. 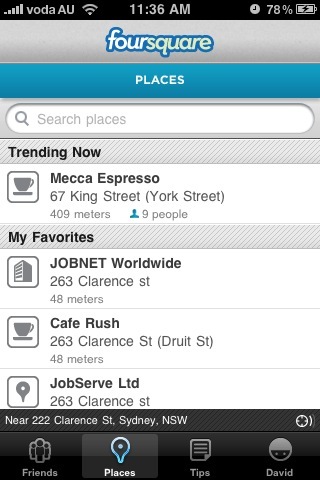 Business owners using Foursquare – you know who to target!